Arlo allows you to generate a list of email addresses to send emails using your default browser email client. The following article describes how to send an email from an event. Note: To complete this, you need to ensure your browser (e.g. Internet Explorer) is set up to use your correct email client. 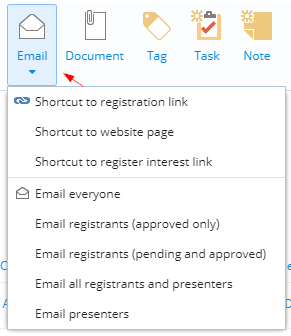 Find and select the event you would like to send emails for. Press Email and select the contacts you would like to email from the list. 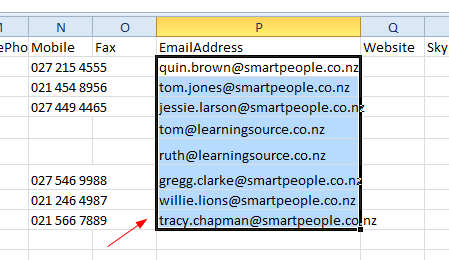 Note: Some mail clients (like Outlook) can have limits on the 'To' and 'BCC' fields which may mean not all email addresses are included. We advise checking that all recipients are listed in the outgoing email. You can use your presenters' details in Arlo to easily generate a list to use when sending an email. You will need Microsoft Excel to complete this process. Click Export, and select Export what I see (CSV). A spreadsheet file (CSV format) will be downloaded. Open this in Microsoft Excel. Select the presenter's email addresses. Right-click and select copy from the menu. Note: Pressing Ctrl + C will also copy the content you have selected. Use your email application to open a new email. Right-click and select Paste from the menu in the 'To' field. Note: Pressing Ctrl + V will also paste the content. You can easily generate the email address to use of any contact, presenter, or lead in Arlo. Open the contact, presenter, or lead record. Press Email and select New email. Your default mail client will open a new email with the contact details of the selected record. Arlo allows you to send text messages to your registrants using Arlo for Mobile. This lets you reach out to your registrants in more ways. Learn how to contact registrants using Arlo for Mobile. Resending communication will send it to the original email address. If the contact's email address has been updated in Arlo and you wish to send the communication to their new email, you will need to forward the communication instead. You can view a list of all the emails sent from Arlo by accessing the communication log on an item (e.g. an event or contact). You can also view, print, forward, and re-send each email. To resend an email, select an email(s) and press Resend. Hint: You can search for emails using the search bar on the page. To forward or print an email, open it from the list and press Forward or Print. Note: When you forward communication, if the order contact was copied (cc'd) into the original email, they will also receive the forwarded email that you send, including any edits to the subject line. You can also access communication for an entity on their communication logs. Each entity has their own log which stores all of the automated communication Arlo has ever sent to them. Access communication for an event by pressing the Communication tab. Access communication for a contact by pressing the Communication tab. Access communication for an order by pressing the Communication tab. Arlo allows you to easily manually send event instructions to event registrants, for example, if you choose not to send them automatically when registrations are created. Find and select the event you would like to send event instructions for. Select the registrants you would like to send instructions to. Press Actions and select Resend instructions.